WMS Industires, Inc. was formed in 1974 and went on to achieve amazing success in the pinball, video arcades and hone video game markets. With a proven track record as a company that could make cutting-edge games, video and software technology and with manufacturing facilities fitting for their business, WMS’s foray into gaming was a natural progression for the company. WMS Gaming, Inc. was formed in 1991 as a subsidiary of WMS Industries and their first venture was in the video lottery terminal (VLT) business in the same year. They successfully established themselves as a major player in the video lottery market, creating, manufacturing and placing VLT’s throughout jurisdiction in North America. Once the company had achieved that goal, WMS gaming entered the casino gaming business with the unveiling of a video poker game and a year later, the company introduced a whole range of technically advanced upright slot machines. Another reason why the company was on the video slot machines scene so fast is because they were involved in a legal battle with competitor company IGT over some of their reel ( or mechanical ) slot machines and had to produce something else in order to survive and carry on. Since that time, the company has actually secured licensing from IGT and produced a line of reel-spinners alongside their video poker range of slot machines. WMS Gaming now holds the licensing to the following brands with regards to the manufacture and production of slot machines: Clint Eastwood, Hollywood Squares, Match Game, Men In Black, Monopoly and Powerball. In 1997, WMS Gaming premiered what would prove to be it’s most successful video slot machine to date and it was christened Reel ‘Em In. 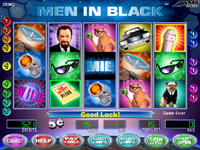 This multi-coin, multi-game offered numerous bells and whistles for the slot machine player and in an effort to create an enhanced playing experience for it’s users, WMS Gaming installed hi-resolution screens in it’s games, allowing fully coloured detailed graphics and they also provided an enjoyable game theme, with many betting options and increased the hit frequency for the player. Since 1998, WMS Industries has been engaged entirely in the manufacturing, sale, leasing and licensing of gaming industries and in 2000, the company shut down it’s pinball game design, manufacturing and cabinet manufacturing operations. In 2003, WMS Gaming introduced their newest game platform, CPU-NXT, which has proven to be a huge hit with film quality animation and extremely high resolution and this technology was used as the groundwork for their Reel ‘Em In Classic slot machine, mentioned above. The company’s corporate office is in Waukegan, Illinois and the primary development campus is based at Chicago, Illinois. There are other development, sales and field services offices throughout the United Sates and their international development offices are in Uxbridge, England and Australia too. The International Sales is based in Barcelona, Spain. WMS was adopted as the company name based on the ticker symbol for Williams and WMS Industries, Inc. itself is traded on the New York Stock Exchange. In 2005, WMS entered into a wide-ranging technology transfer agreement with Cyberscan Technology Inc. The Reel ‘Em In Classic slot machine now has two sequels, called in chronological order, Reel ‘Em In: Cast For Cash and Reel ‘Em In Big Bass Bucks.